Prof. Thomas Farrell (Brock University, Canada) was invited by the Teacher Training Dept. 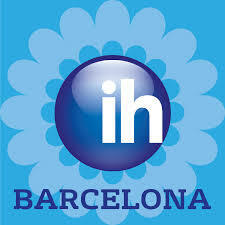 at IH, Barcelona to give a seminar on Reflection in Language Teaching for local EFL teachers. 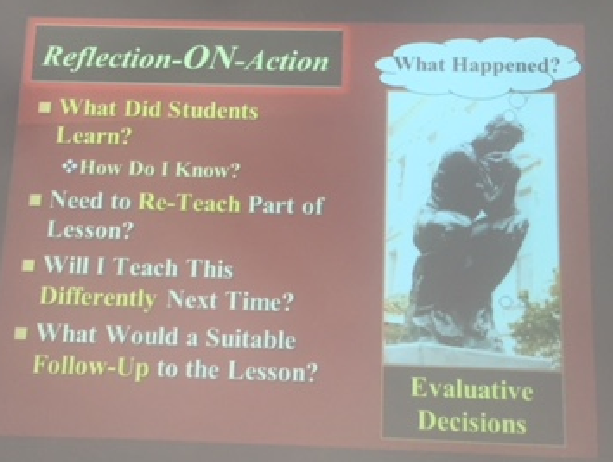 The session started with an invitation to reflect (!) 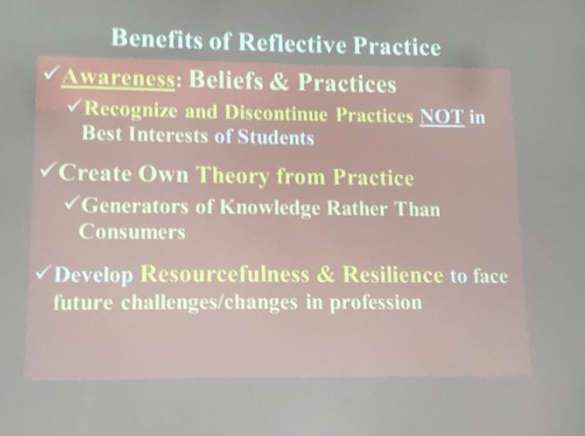 on what Reflective Practice (RP) actually is. It is universally understood to be a mark of professional practice and pre-service teachers are often asked to keep a Reflective Journal as part of their teaching practice. 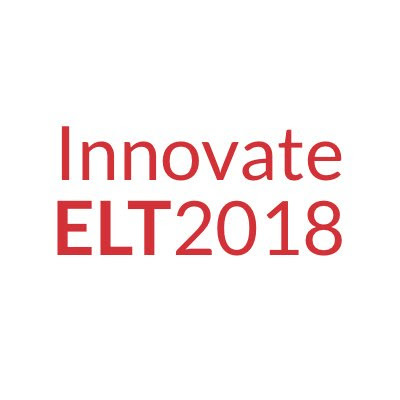 However, experienced teacher educators are aware that many trainees simply ‘fake it’ and complete their journals with what they think their trainers want to hear. What do you do in this situation? We were invited to compare ideas with a partner, but, as Prof. Farrell warned, there is no one ‘answer’ to this problem. 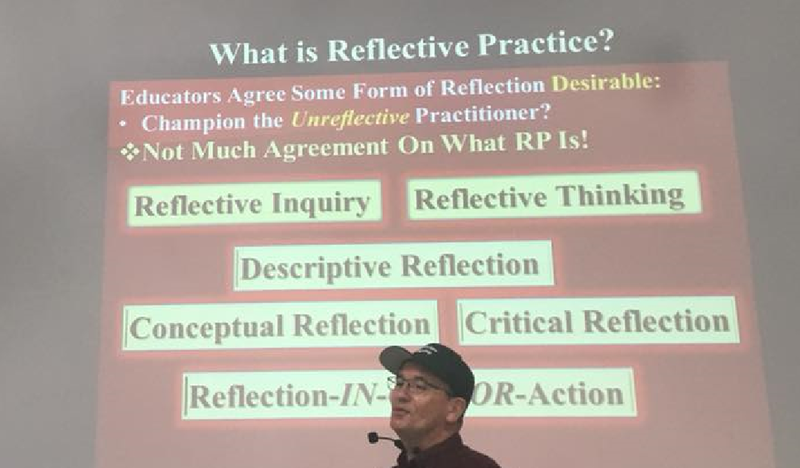 RP offers a number of ways of approaching the problem, which may lead to a solution for your unique situation and unique group of learners. 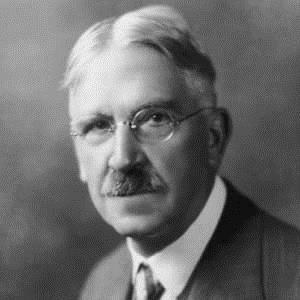 These are based on insights from the work of John Dewey (1859-1952) one of the major advocates of educational reform in the 20th century. 1. Suggestion: Identify the issue. 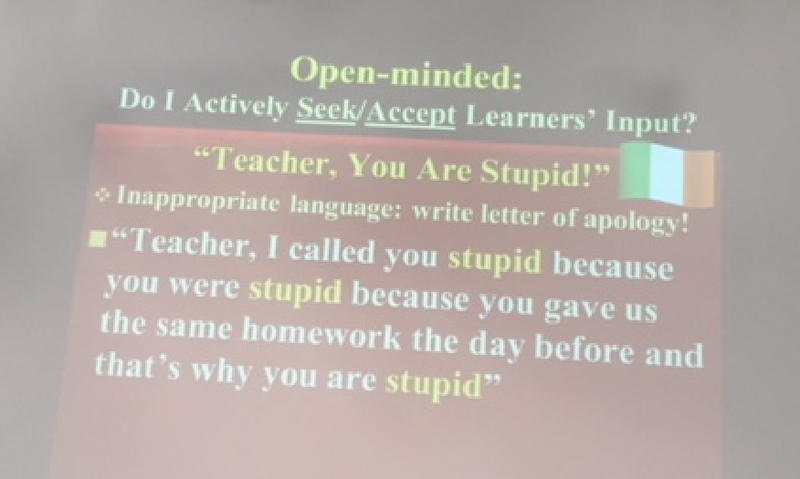 In this case – the students won’t / don’t speak in class. A number of ideas spring to mind which might explain this situation. 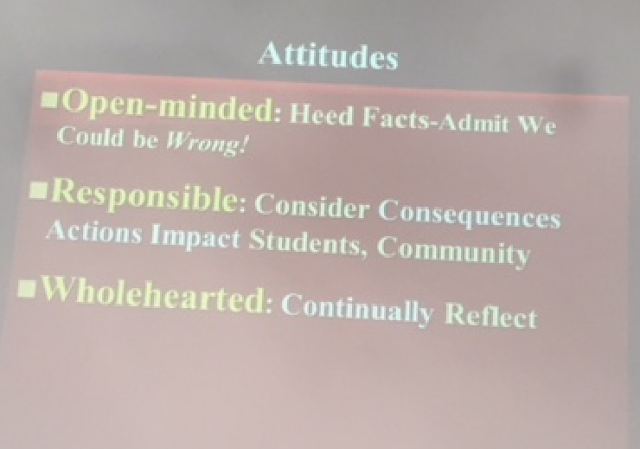 As we are confident in our teaching abilities, we may be tempted to assume that the problem lies with the students. However, it is important to suspend immediate judgments, the problem could be related, for example, to the currículum. This may involve (reluctantly!) asking yourself whether the root of the issue resides in your teaching practice. 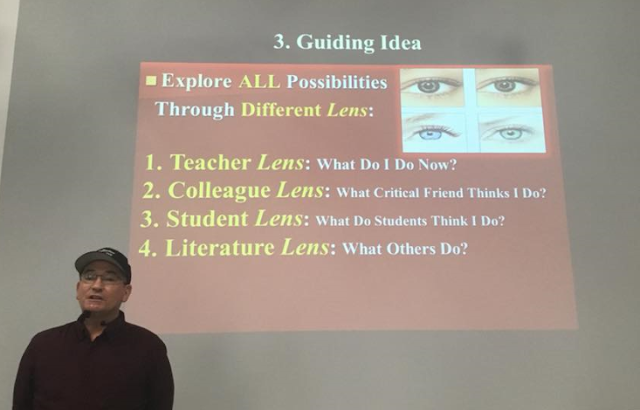 - The Teacher Lens: What do I do now?. It is important to be aware that this is not what you think you do, but what you actually do. At this point, Prof. Farrell advised against telling a teacher what to do, as this will lead to a condition known as ‘learned helplessness’ (Seligman, 1972), when people feel helpless to avoid negative situations. - The Colleague Lens: Allow a ‘critical friend’ (a trusted colleague) to observe and analyse the problem. It is important to emphasise that ‘critical’ in this sense does not mean looking for the negative, but rather holding up a mirror to your practice. Teachers already have a tendency to be very self-critical, this will only be exacerbated by criticism from others. Prof. Farrell even compared an evaluative observation done by a supervisor as a ‘drive-by shooting’! 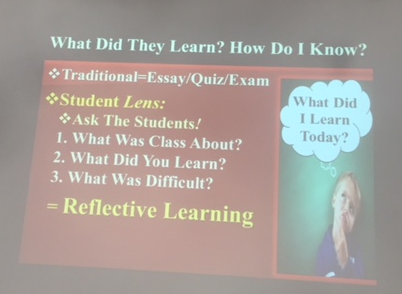 - The Student Lens: What do students think I do? Students are observing us in every class and are ultimately our target clients/customers. 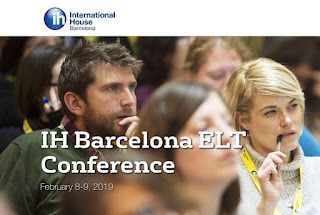 - The Literature Lens: What do others do? While Prof. Farrell made the point that many teachers run for the door at the mere mention of research, it is possible to find examples of research written by teachers for teachers which can usefully inform your practice. This is a low inference analysis – the observer maps the position of the people in the room and notes down when, how long and between whom each interaction occurs. The analysis revealed that the teacher asked 45 questions and the wait time in each case was less than one second. The teacher was completely unaware that she was doing this. 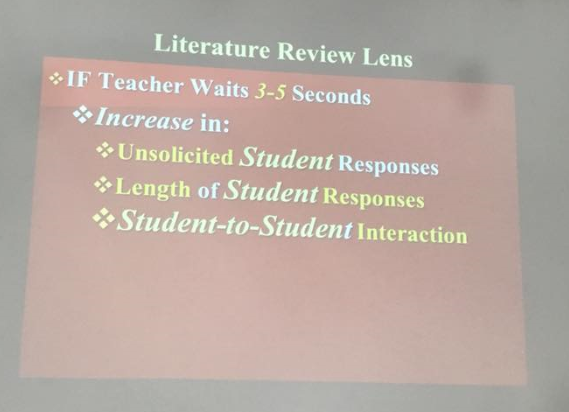 The addition of the ‘Literature Lens’: exposes the teacher to relevant research on the topic, allowing her to see how extending the wait time can lead to increased number and length of student responses. 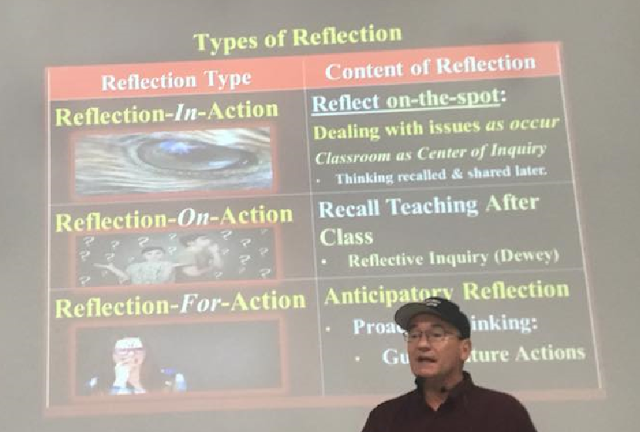 Reflection – IN – action: An experienced teacher has a hawk’s eye view of the class and can read and interpret development and interaction as it happens. 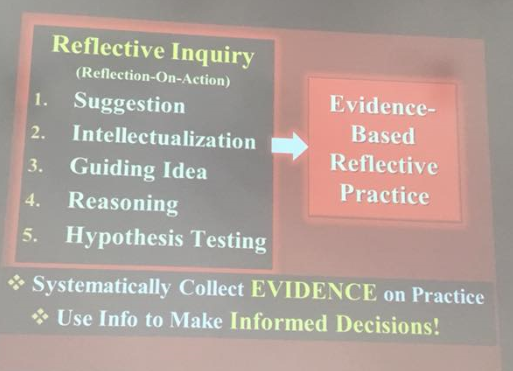 This is ‘on-the-spot’ reflection where the classroom is the centre of enquiry. Such online decisions may be made on the basis of questions such as: ‘Are my instructions clear?' 'Am I including everybody?’. For example, in an observation study conducted by Prof. Farrell into the ‘Teachers Action Zone’ (the area in which the teacher moves and interacts), 138 out of 140 teachers ignored the left-hand side of the room without being aware of it! Other questions to consider in the moment may include: ‘Are my activities going as planned?’ ‘Are they too easy / too difficult?’. One area ripe for relection, as we have seen previously, is teacher questions: ‘How many?’ ‘What type: display or referential?’ ‘Do I leave enough wait time?’ etc. 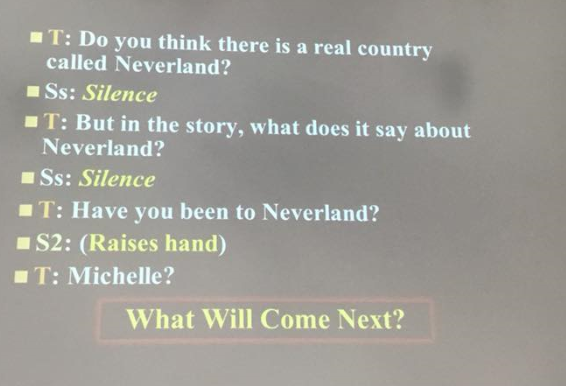 Below is just one extract from a transcription of a situation which teachers will find painfully familiar: a sequence of teacher questions met with silence from the group, until finally one student raises her hand. Michelle’s answer was: ‘Can we give in the grammar homework on Monday’? 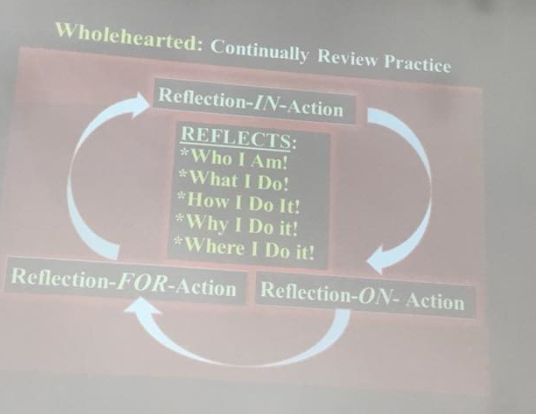 Reflection – ON – action: After the class, we ask ourselves ‘What happened?’ ‘What did the students learn and how do we know?’ Prof. Farrell suggested that this is where we should bring in our learners’ voices. They should also be asking ‘What did I learn today?’. 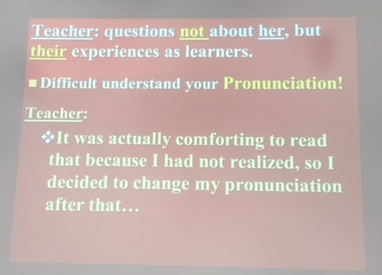 The traditional way of finding out what and whether our students have learnt is by testing, either formally or simply asking ‘round up’ questions in the last 10 minutes of class, e.g. ‘What’s the past tense of GO?’ (usually directed at the best student!). 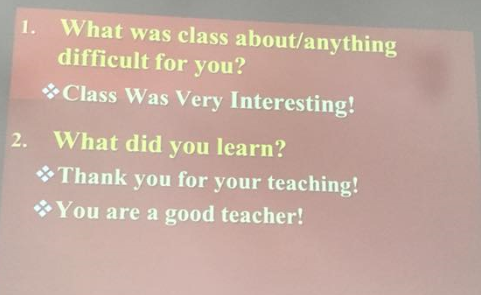 - What was the class about? 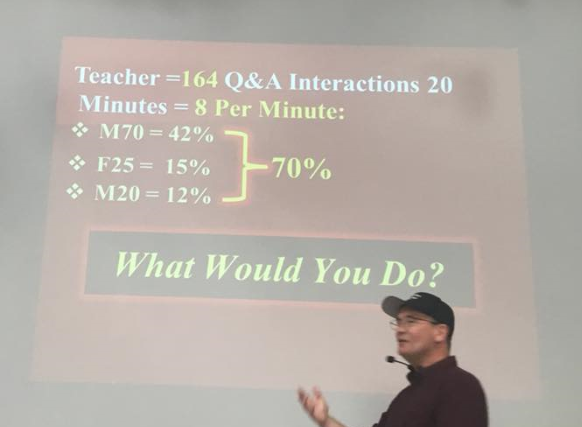 - What do I want my students to learn from this lesson? - What are my students’ fears? 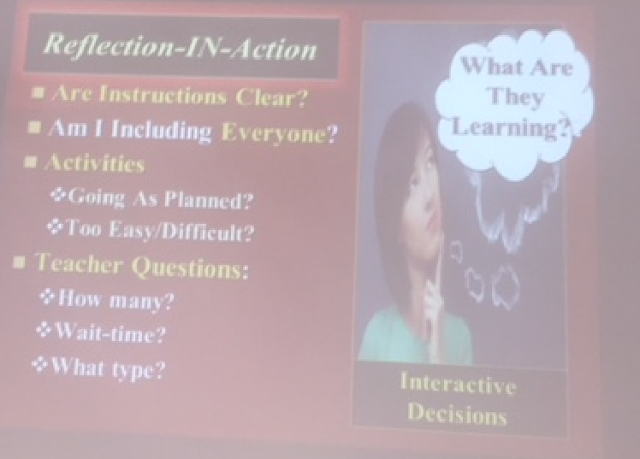 Prof. Farrell pointed out that experienced teachers will abandon a lesson plan if they see that it is not working. 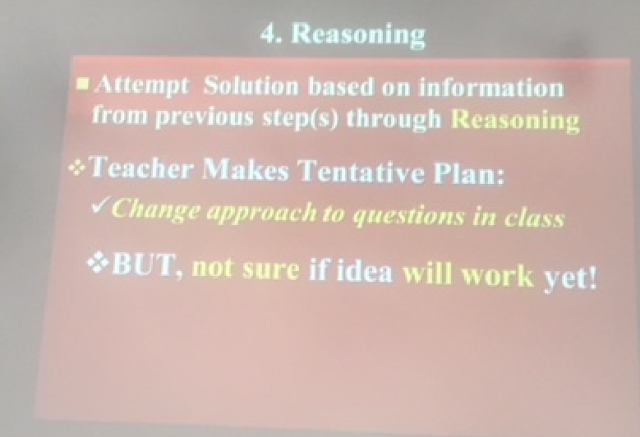 In contrast, a novice teacher will stick to the lesson plan, no matter what! 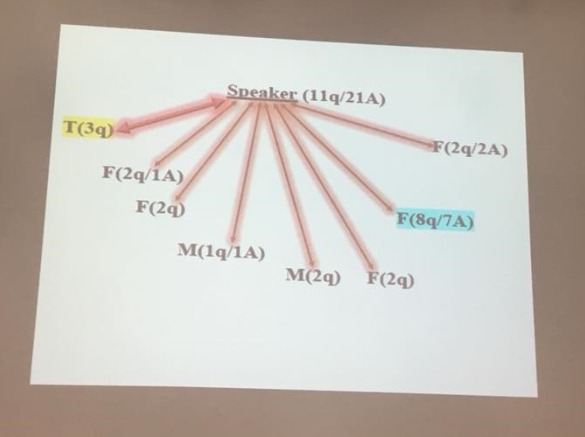 In another example of an observation study, a teacher wanted to ensure that she distributed questions fairly, asking at least two questions to each student. 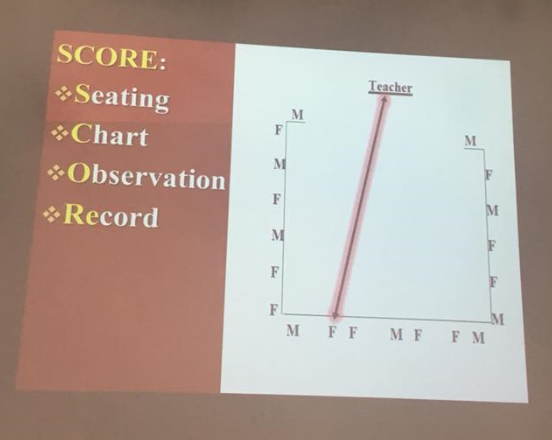 A SCORE analysis revealed that three learners in the group received 70% of the teacher’s attention, much to her surprise. The participants were invited to discuss what they would do if faced with this situation. Once again, there is no one right answer. The teacher in this case consulted a group of her fellow trainees, who suggested the ‘Speaking Sticks’ technique. 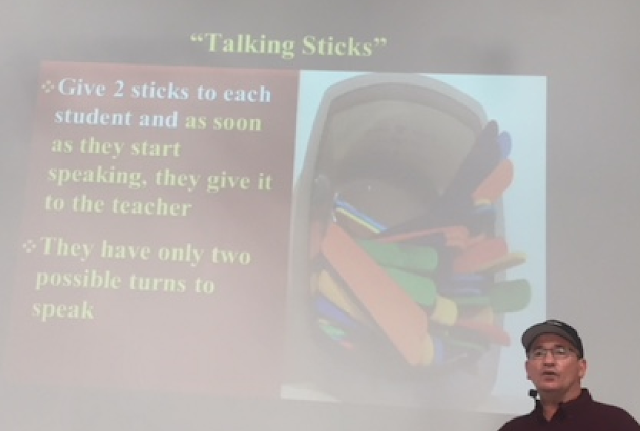 Each student in the group is given two speaking sticks, each stick represents an opportunity to speak (Prof. Farrell suggested ‘borrowing’ some of the stirring sticks from Starbucks). Give me the talking stick! Learner feedback: Harsh but fair? - A teacher should be continually striving to improve and therefore should feel that tension between beliefs and practices. 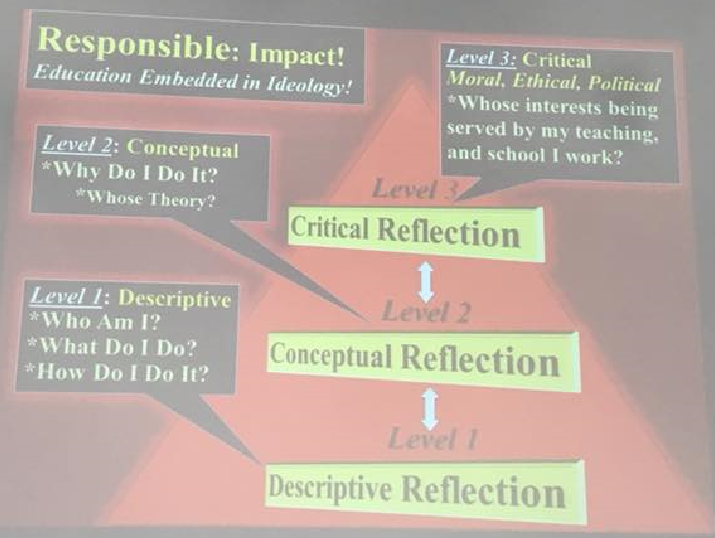 - A reflective practitioner should be able to elaborate their own teories based on practice. - RP can help teacher develop resourcefulness and resilence. 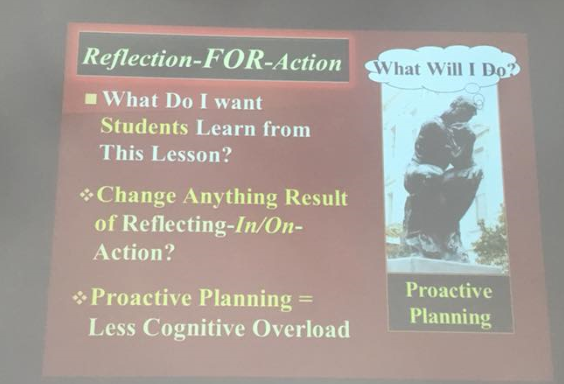 What can Reflective Practice do for you? Visit Professor Farrell’s website here. Dewey, J. (1909) Moral Principles in Education, The Riverside Press Cambridge, Project Gutenberg. Seligman, M. E. P. (1972). "Learned helplessness". Annual Review of Medicine. 23 (1).